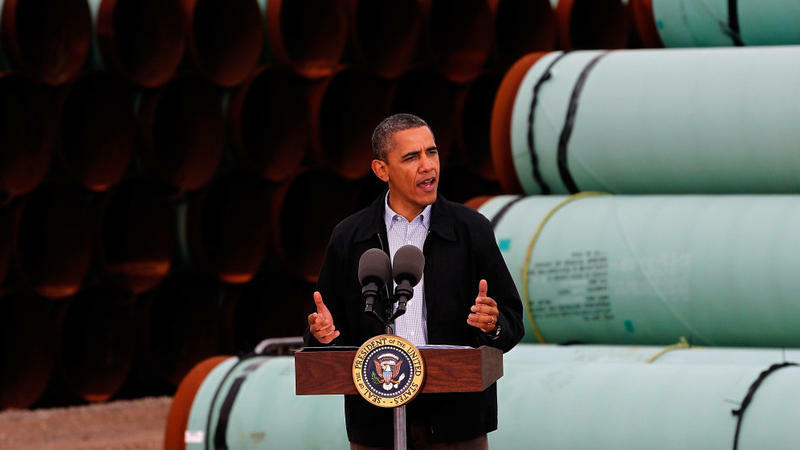 Just How Many Jobs Would The Keystone Pipeline Create? 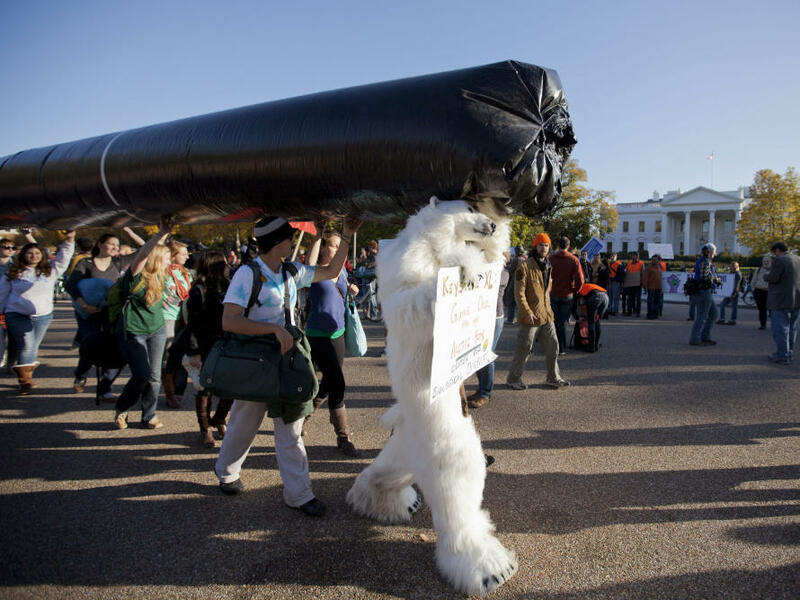 Demonstrators march with a replica of a pipeline during a protest to demand a stop to the Keystone XL tar sands oil pipeline outside the White House last November. 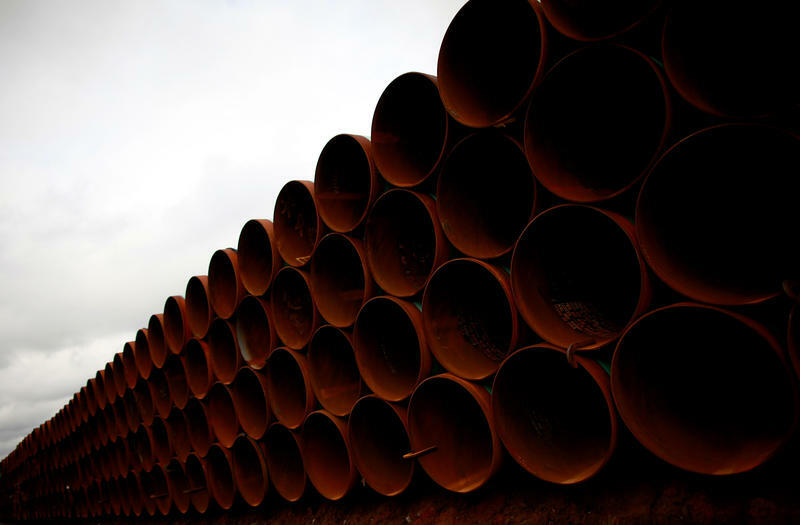 One of the major sticking points between the House and the Senate as they face off over end-of-year legislation is the controversial Keystone XL pipeline. The bill the House passed Tuesday contains a provision forcing President Obama to decide on the pipeline within 60 days. Republicans say this project should move ahead quickly because it will create thousands of jobs. But just how many jobs would be created is a matter of contention. House Speaker John Boehner, an Ohio Republican, described Keystone XL as being "as close to a shovel-ready project as you're ever going to see." Republican presidential candidate Jon Huntsman said it would create "more than 100,000 American jobs." And earlier Wednesday on the Senate floor, Republican Kay Bailey Hutchison of Texas said the project "promises 20,000 immediate jobs and 118,000 spin-off jobs." They all appear to be getting their numbers from the same source: TransCanada Corporation, the company behind the project. Alex Pourbaix, an executive at TransCanada, told a House subcommittee earlier this month that the project would create 13,000 construction jobs. "On top of that there are 7,000 manufacturing jobs associated with this project," said Pourbaix. "Twenty thousand jobs in all." What he fails to mention is that the jobs numbers are based on "person years," meaning the number of people employed could be much lower. "That may be in some cases one person working six months and another person working six months," says Ray Perryman, president of an economic research firm based in Texas. "Or it could be if one person works two years, that's two job years." Perryman was hired by TransCanada to look at the broader economic impact of the project. And if you're wondering where Huntsman and Hutchison got the 100,000 jobs-created figure, look no further than Perryman. He adds up all the jobs at all the contractors and manufacturers and suppliers and restaurants and hotels along the way. "That money gets spent and circulated through the economy so ... the 118,000 jobs is the cumulative total of all that during the construction phase," says Perryman. And that's also measured in person years. "It's unsubstantiated," says Sean Sweeney, who directs Cornell University's Global Labor Institute. He co-wrote a paper that found the numbers to be exaggerated. "I'm not sure where 20,000 comes from," adds Sweeney. "We know the direct construction jobs are nowhere near 20,000. We know the steel, or a portion of it, is not produced in the United States; so where are the jobs?" Perryman describes the Cornell paper as "advocacy." A recent State Department study said the construction workforce would be 5,000 to 6,000 workers. And once the construction phase ends, almost all of these jobs, however many are created, would go away. One of the major sticking points in this debate isn't about payroll tax cuts at all. It's about the controversial Keystone XL pipeline. The bill the House passed yesterday contains a provision forcing President Obama to approve or reject within 60 days the building of the pipeline. Republicans say the project should move ahead quickly because it would create thousands of jobs. But NPR's Tamara Keith reports that that depends on how you define a job. TAMARA KEITH, BYLINE: The Keystone XL pipeline would transport crude oil from Alberta, Canada to refineries in Texas. And a big part of the pitch is how many jobs it will create. REPRESENTATIVE JOHN BOEHNER: The American people want jobs. This is as close to a shovel-ready project as you're ever going to see. SENATOR KAY BAILEY HUTCHISON: That promises 20,000 immediate jobs and 118 thousand spinoff jobs. KEITH: That was House Speaker John Boehner, presidential candidate Jon Huntsman and Republican senator from Texas, Kay Bailey Hutchison. They all appear to be getting their numbers from the same source, TransCanada, the company behind the project. Alex Pourbaix, an executive at TransCanada Corporation, told a House subcommittee the project would create 13,000 construction jobs. ALEX POURBAIX: On top of that, there are 7,000 manufacturing jobs associated with this project; 20,000 jobs in all. KEITH: What he fails to mention is that the jobs numbers are based on person-years, meaning the number of people employed could be much lower. Ray Perryman is president of an economic research firm based in Texas. DR. RAY PERRYMAN: You know, that may be in some cases one person working six months and another person working six months. Or it could be if one person works two years, that's two job years. KEITH: Perryman was hired by TransCanada to look at the broader economic impact of the project. And if you're wondering where Huntsman and Hutchison got the hundred thousand jobs created figure, look no further than Perryman. He adds up all the jobs at all the contractors and manufacturers and suppliers and restaurants and hotels along the way. PERRYMAN: That money gets spent and circulated through the economy. So, it's - the 118,000 jobs is the cumulative total of all that during the construction phase. KEITH: And that's also person years. PROFESSOR SEAN SWEENEY: It's unsubstantiated. KEITH: Sean Sweeney directs Cornell University's Global Labor Institute. And he co-wrote a paper that found the numbers to be exaggerated. SWEENEY: I'm not sure where 20,000 comes from. That we know the direct construction jobs are nowhere near 20,000. We know the steel, or a portion of it, is not produced in the United States. So where are the jobs? KEITH: A recent State Department study said the construction workforce would be five to six thousand workers. And once the construction phase ends, almost all of these jobs, however many are created, would go away. Tamara Keith, NPR News, the Capitol. Transcript provided by NPR, Copyright NPR. Thursday marked the first time President Obama has visited Oklahoma since running for the White House in 2008. He didn't win the state four years ago, and he's not expected to carry the traditionally red state this November, either. But one Oklahoma town took center stage Thursday as Obama wrapped up a two-day tour of four states promoting his energy policy. The State Department, which is ultimately charged with approving or denying TransCanada's plans to build a 1,700 mile pipeline from Canada and through the U.S., has released a draft report that details the potential environmental impacts of the Keystone XL pipeline.